The Catholic Artists Society is presenting a lecture by James Patrick Reid, T.O.P., entitled “Art and Transformation.” The presentation demonstrates, through the examination of paintings by Giotto, Chardin, and other masters -- correlated with insights from Maximus the Confessor and Thomas Aquinas -- the specific ways in which visual art magnifies the mysteries of the divine conservation and governance of nature. The lecture culminates in a meditation on the splendor of divine providence in a work by Beato Angelico. 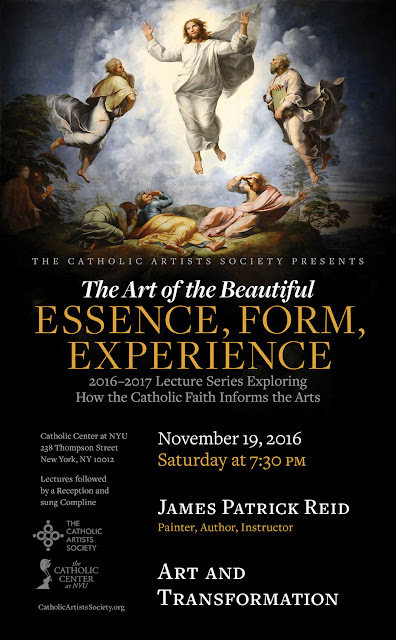 This event will take place on Saturday, November 19, at the Catholic Center at New York University, 23 Thompson Street, in New York City. James Patrick Reid is a painter and scholar specializing in the intersection of art and theology. He has taught at Union College, the New York Academy of Art, and the Art Students League, and is currently on the faculty of the Fashion Institute of Technology. Mr. Reid has lectured at Thomas Aquinas College and the Franciscan University of Steubenville, among many other distinguished venues. His writings have appeared in the monograph Intimations of Paradise: the Photographs of Christopher Burkett, in the American Arts Quarterly, and in the journals Prosopon, Seen and The Catholic Thing. His article, Invisible Things Clearly Seen: Visual Art in the Drama of Salvation, will appear in the January/February issue of the Saint Austin Review.